Confessing is cathartic. Every Yom Kippur in our home, I confess my shortcomings to my wife and my children. I apologize to them for raising my voice to them, for being unnecessarily critical of them, for not always understanding their personal challenges. I feel better after I do this because it helps me renew my spirit and become, I hope, a better person in the coming year. Yom Kippur, after all, is a day of forgiveness when God forgives us for our sins. But our Sages emphasize that God does not forgive us unless we first make amends for the sins committed against our fellow man. Confessing our mistakes and apologizing to our loved ones brings us closer to them and closer to God who desires our contrition, especially at this time of year. Such a personal admission acknowledges that we are imperfect yet sends a signal that we desire to improve ourselves and our relationships. It is noteworthy that a confessional scene in The Bourne Supremacy humanizes the hero in a way that connects him to all of us who have made regrettable mistakes in life and want to become better. 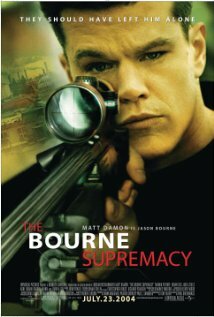 The Bourne Supremacy, the second in the trilogy of Bourne movies, is a great action movie; but what sets it apart is not only the superbly choreographed action sequences, but the humanity of its hero, Jason Bourne, a man searching to discover his lost identity. We believe his confusion. We believe that, in spite of his job as a professional assassin, he is essentially a good man. His humanity is exquisitely captured in a touching scene towards the close of the film in which Jason Bourne contacts the daughter of a Russian diplomat and his wife whom Bourne has assassinated. He shows up at her apartment unannounced and in a soft voice informs her that, contrary to what she thought, her mother did not kill her father and did not kill herself. He confesses in slow, carefully deliberate language: “I killed them. I killed her. That was my job. But it was my first time. Your father was supposed to be alone, but then your mother came out of nowhere and I had to change my plan. It changes things, that knowledge, doesn’t it? What you love gets taken from you. You want to know the truth. I’m sorry.” The confession purges Bourne of some of his guilt. He cannot retrieve the past but he has come to terms with it by admitting his crime to the child who was a survivor. Moreover, confession works in more than one direction. It is cathartic for the one who confesses, for he is changed by speaking the words that indict him. Additionally, it changes the reality of the one to whom the confession is addressed. Acknowledging the words of a penitent can alter the life of the one who was hurt as well. The truth that Bourne reveals to the daughter of his victims frees her from a past filled with guilt, deception, and lies. It is a brief scene but its impact is powerful. No longer is the film just a robust and entertaining thriller. It is also a commentary on the human cost of leading a violent life, even when the violence is for the just cause of protecting a nation. Good people can sometimes do very bad things. This vignette reminds us that we can sometimes be cruel inadvertently. Thoughtlessly, we can hurt those we love most. The Bourne Identity reminds us that confession of our sins to those we care about can open a door to our own self-renewal and, just as important, it can allow others to move on with their lives, free of the negative baggage of the past.